Please be aware : you are responsible for the use of this website and any action you take as a result of anything you read on this site. We will not have any liability for anything that you do or refrain from doing based on your use of this website. By using this website you understand that nothing on this website must be construed as legal advice. If you wish legal advice, please contact us to set up a proper legal consultation. This website is used for general informational purposes and cannot predict every possible unique case. If you have any questions about your case, you are urged to contact David Anber directly. By submitting a question through this website, you do not attract “solicitor client privilege”. That means anything you submit through this website (as opposed to a meeting in the office of David Anber) cannot be considered confidential. In awaiting a response to your question, you understand that you may receive a reply from a lawyer, paralegal or other staff in David Anber’s office. You are not to assume that anything they write is legal advice as no legal advice will be provided without a specific indication of such. 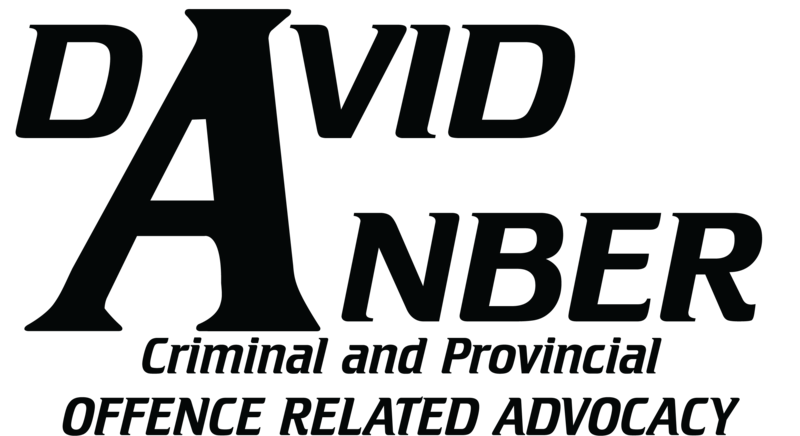 David Anber is a Barrister and Solicitor in the Province of Ontario and is licenced to provide criminal law services in the Province of Quebec. If you are writing for a legal question pertaining to a location outside of Ontario or Quebec, or if you write a question about a provincial law or civil law issue in Quebec, or if you ask a question about something other than penal (criminal/quasi-criminal law) your question may not be answered. When we receive a message through this website, we endeavour to reply within 2 hours as stated however we are not responsible for if we are unable to reply for some time due to reasonable circumstances. Please make sure your junk mail folder is set to allow messages from davidanber.com email addresses. Finally, all material on this entire website is copyrighted and may not be copied, or reproduced without the written consent of David Anber.